This article is about the capital of South Sudan. For other uses, see Juba (disambiguation). Juba /ˈdʒuːbə/ is the capital and largest city of the Republic of South Sudan. The city is situated on the White Nile and also serves as the capital of Jubek State. On 5 September 2011, the government announced the capital would indeed move some 250 km away from Juba to Ramciel, which is situated at the middle of South Sudan and about 60 km from Yirol West County of Lakes state. As of November 2018, the move has yet to occur. Juba is led by a city council headed by Mayor Stephen Wani Michael. This post-independence council was formed in March 2011 and Baballa appointed to lead it by Governor Clement Wani Konga. Former Yei County Commissioner David Lokonga Moses was appointed as deputy mayor. A ministerial committee to keep Juba clean and sanitary was also created by gubernatorial decree at the same time. Because of the war Juba can hardly be called a transport hub anymore. Roads and the river harbour are currently not in use due to disrepair. The United Nations and the South Sudanese government are repairing the roads, but full repair is expected to take many years. In 2003, the Swiss Foundation for Mine Action (FSD) started to clear the roads leading from Juba to Uganda and Kenya. It was expected that these roads would be completely de-mined and rebuilt in the course of 2006–2008. The rebuilding of the roads, which are mostly un-paved, takes a tremendous amount of effort and time because of the limited work season due to the lengthy rainy season, which lasts from March until October. The roads are important for the peace process in Sudan as people need them to return to their homes and to regain what they feel is a normal life. The first road that has started to be rebuilt is the road to Uganda. This road is particularly important, as many of the original inhabitants of Juba fled to Uganda during the war. As of 2009[update], there are three paved roads in Juba, one that was re-surfaced in July. The main one is a concrete road, built by the British in the 1950s. Starting December 2018, an emerging NGO, The South Sudan Library Foundation intends to finance and donate the first library to South Sudan. Juba International Airport (IATA: JUB, ICAO: HSSJ) is the site of large numbers of flights bringing UN and NGO (non-governmental organization) aid into Southern Sudan, as well as passengers and general air freight. The airport is very busy, among the busiest in East Africa. The construction of a new terminal was begun in late 2007 when the oil prices were very high ($100+). Since then, with the oil prices going back down, the fate of the new terminal is uncertain. Building on the new terminal restarted in early 2014 As of February 2014, there are daily flights to Jomo Kenyatta International Airport in Nairobi, Kenya; Khartoum International Airport in Sudan; Entebbe International Airport in Entebbe, Uganda; and Bole International Airport in Addis Ababa, Ethiopia. The United Nations Mission in South Sudan (UNMISS) has a large compound near the Juba Airport. In 2005, Juba's population was 163,442. 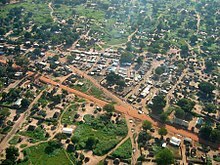 Based on analysis of aerial photos, the best estimate of several donors working in Juba calculated the 2006 population at approximately 250,000. The 5th Sudan Population and Housing Census took place in April/May 2008, stating the population of Juba County to be 372,413 (the majority residing in Juba City, which dominates the county), but the results were rejected by the Autonomous Government of Southern Sudan. Juba is developing very rapidly due to oil money and the Chinese coming for work and development. In 2011, the population of the city of Juba is estimated at approximately 372,410, but may potentially be more. As of 2013[update], the city's population was growing at a rate of 4.23%. Juba has been described as undergoing an economic boom, especially in the past five years and since independence. The prospect of an economic boom has brought thousands of merchants to Juba, mostly from northern Sudan and from East Africa. As of October 2010[update], several regional and international businesses have established a presence in Juba. The Commercial Bank of Ethiopia and the Kenyan banking conglomerate Kenya Commercial Bank has its South Sudanese headquarters in the city and a branch network of eleven (11) branches throughout South Sudan. The three indigenous South Sudanese commercial banks namely; Buffalo Commercial Bank, Ivory Bank and Nile Commercial Bank, all maintain their headquarters in Juba. Equity Bank, another regional finance services provider also has a branch in Juba. National Insurance Corporation (NIC), the leading Ugandan insurance services provider, maintains an office in the city. Despite recent economic difficulties brought about by the December 15th 2013 civil war, Juba has continued to grow and construction is still booming. This is probably due to the high demand for affordable housing and hotel accommodations. Research from the Overseas Development Institute found that markets in Juba are transient, as many traders only come to make a quick profit and so do not invest in storage facilities or shops. ^ "Define Juba: noun 2. a city in S Sudan, on the White Nile". Dictionary.com. Retrieved 27 October 2013. ^ "Jubek State calls upon TGoNU to protect traders". The National Mirror. 8 August 2016. Retrieved 14 August 2016. ^ Richardson, J.N. (1933). "Bari Notes". Sudan Notes & Records. 16 (2): 181–186. ^ Keen, Rosemary (n.d.). "Church Missionary Society Archive, General Introduction and Guide to the Archive". ampltd.co.uk. Adam Matthew Publications, Pelham House. Retrieved December 16, 2016. ^ Nalder, Leonard F. (1936). Equatorial province handbook. Anglo-Egyptian Sudan government memoranda. OCLC 3450641. ^ Werner, Roland; et al. (2000). Day of devastation, day of contentment: the history of the Sudanese church across 2000 years Volume 10 of Faith in Sudan. Paulines Publications Africa. ISBN 9966215298. ^ a b Badiey, Naseem (2014). The State of Post-conflict Reconstruction: Land, Urban Development and State Building in Juba, Southern Sudan. Boydell & Brewer Ltd. p. 38. ^ Shuichiro, Nakao (2013). 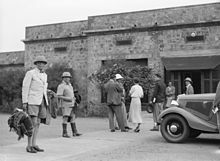 "A History from Below: Malakia in Juba, South Sudan, c. 1927-1954". The Journal of Sophia Asian Studies. 31: 139–160. ^ "Kiir makes changes in Civil Aviation Authority, appoints CEO". 17 November 2017. Retrieved 22 November 2017. ^ "Central Equatoria State". NileBuffalo Gazette. 2008. Archived from the original on 20 March 2011. Retrieved 28 July 2011. ^ "Gulu – Juba Railway in the Offing". Pachodo.org. 20 September 2010. Archived from the original on 7 October 2011. Retrieved 20 June 2012. ^ Thome, Wolfgang H. (14 September 2010). "Railway Link From Juba May Go Directly To Kenya". Eturbonews.com. Retrieved 20 June 2012. ^ "Estimated Population in 2011". Wolframalpha.com. Retrieved 20 June 2012. ^ a b "The World Factbook: South Sudan". World Factbook. Central Intelligence Agency. Retrieved 2013-12-31. ^ "Estimated Population in 2006". Tripwiser.com. Retrieved 20 June 2012. ^ "About KCB Southern Sudan". Kcbbankgroup.com. 4 March 2008. Retrieved 20 June 2012. ^ "Climate: Juba – Climate graph, Temperature graph, Climate table". Climate-Data.org. Retrieved 27 October 2013. ^ "World Weather Information Service – Juba". World Meteorological Organization (UN). Retrieved 21 March 2013. ^ "Juba Climate Normals 1961–1990". National Oceanic and Atmospheric Administration. Retrieved 18 January 2016. ^ "Klimatafel von Juba / Sudan" (PDF) (in German). Deutscher Wetterdienst. Retrieved 3 November 2016. ^ "The First South Sudanese baby named Independent". CBC News. 10 July 2011. Retrieved 9 July 2012. ^ Ros Wynne-Jones (7 July 2012). "Happy Birthday South Sudan?". The Independent. Retrieved 9 July 2012. Independent Moses, like one in 10 babies in South Sudan, had not reached his first birthday, dying of Africa's biggest killer, diarrhoea. ^ "Over 40 killed in plane crash, as Juba regrets the incident – Sudan Tribune: Plural news and views on Sudan". Sudan Tribune. Retrieved 2016-07-22. Wikivoyage has a travel guide for Juba. Wikimedia Commons has media related to Juba. This page was last edited on 14 March 2019, at 01:34 (UTC).